Stag’s Hollow Winery has always had a fairly large portfolio of wines- and that is the way the owners like it. New next spring, there will be a 2018 Blanc de Noirs from Stag’s Hollow. It is made primarily with the winery’s Ritter Clone of Pinot Noir, with a little Gamay Noir. The wine, which shows a slight blush, is being aged in oak and is getting regular lees stirring to build texture. About 200 cases will be bottled. The winery’s penchant to be different has been aided its Shuttleworth Creek Vineyard. This 18-acre property just north Okanagan Falls was acquired in 2011. To date, 10 acres has been planted, with about three more plantable acres remaining. Shuttleworth Creek is just two km north of the winery’s estate vineyard. The two properties have begun to produce enough fruit that Stag’s Hollow is about 85% self-sufficient. The two vineyards are quite different aspects, giving the winery the option to grow a wide variety of grapes. Shuttleworth Creek grows two Spanish varietals, Albariño and Tempranillo; two Italian varietals, Dolcetto and Teroldego; six clones of Pinot Noir and a small block of Vidal. This spring, Stag’s Hollow planted Syrah here as well. “Our goal is to make rosé from the Syrah vines,” Linda says. The winery’s current releases include an Albariño from Shuttleworth Creek, a Pinot Noir from the estate vineyard, and a Syrah from the grower-owned Amalia Vineyard near Osoyoos. Stag’s Hollow Albariñ0 2017 ($18.90). This wine begins with appealing aromas of citrus and melon with floral notes. On the palate, there are flavours of apple and tropical fruits around a spine of minerality. The finish is crisp. 91. Stag’s Hollow Pinot Noir 2016 ($21.99). In the technical notes accompanying the wine, Stag’s Hollow notes that the wine is “slightly more masculine” than its Pinot Noirs from Shuttleworth Creek. That reflects the fact that the estate vineyard, a sunbathed bowl, is the hotter of the two vineyards. Dark in colour, the wine begins with aromas of cherry mingled with earthy notes. The palate is juicy, with flavours of cherry and good acidity to keep the fruit bright and lively. The texture is silky. 91. Stag’s Hollow Syrah 2016 Amalia Vineyard ($25.99). The wine begins with aromas of black pepper, fig and plum. There is a big gob of sweet fruit on the generous palate, with the flavours echoing the aroma. 92. Noble Ridge Vineyard & Winery has two remarkable vineyards in Okanagan Falls. The one at the winery’s tasting room is a rounded peak, with grape vines on all four exposures. The result: fabulous Cabernet Sauvignon on one slope, fabulous Pinot Noir on another, and terrific fruit for sparkling wine on a third. Retired lawyer Jim D’Andrea and his wife, Leslie, purchased this 25-acre hilltop in 2001. Cabernet Sauvignon, Merlot and Chardonnay were already planted. They added Pinot Noir (for sparkling wine) and Pinot Gris. In 2006, they purchased an existing vineyard across the road. Whenever the vineyards yield superlative fruit, the winery makes an ultra-premium wines that are released under the label, King’s Ransom. This fall Noble Ridge released its first King’s Ransom Cabernet Sauvignon from the 2015 vintage. If ever there was a vintage to ripen Cabernet Sauvignon in the Okanagan, it had to be 2015. This is an expensive wine but it is also one of the best Cabernets ever from the Okanagan. Earlier in the fall, the winery also released some reserve wines, with the head of a lion on each label. Think of them as the King’s pride of lions. The most recent release also includes the 2015 vintage of “The One” – the winery’s traditional method sparkling wine. At the recent Judgement of BC tasting, where six BC sparkling wines were matched against six imported sparkling wines, The One was judged number two among the BC wines and fifth overall. The bottom line: Noble Ridge is delivering very high quality wines. Noble Ridge Reserve Chardonnay 2015 ($N/A for 233 cases). This wine, which was aged 14 months in French oak, begins with aromas of peach and citrus. It is rich, even creamy, on the palate with flavours of butterscotch, hazelnut and marmalade. 91. Noble Ridge The One Brut Sparkling Wine 2015 ($39.90 for 324 cases). This is 70% Chardonnay and 30% Pinot Noir. The wine was 28 months en tirage. It is delicious, with notes of brioche on the nose and palate, along with subtle flavours of apple. The wine has two grams of residual sugar, just enough to support a generous texture on the palate. 92. Noble Ridge Reserve Meritage 2015 ($34.90 for 670 cases). This is 77% Merlot, 19% Cabernet Sauvignon, two per cent each of Cabernet Franc and Malbec. This wine, which was aged 14 months in French and American oak, was double-decanted. It has aromas of black currant, black cherry and chocolate, which are echoed on the palate along with notes of chocolate and tobacco. 93. Noble Ridge Reserve Pinot Noir 2016 ($34.90 for 648 cases). This is a dark and muscular Pinot Noir that was aged 14 months in French oak (20% new). It has aromas and flavours of plum and cherry with a toasty note on the finish. Decant this wine. 91. There is a view that far too many grape varietals are grown in the Okanagan Valley. Chris Tolley, the co-proprietor of Moon Curser Vineyard in Osoyoos, would differ. The Moon Curser portfolio is unusually rich with varietals that would not be considered mainstream for the valley. Such as Arneis, Dolcetto, Tannat, Tempranillo, Touriga Nacional and Carménère. Coming soon: Nebbiolo. There is a nod to mainstream varietals such as Viognier, Syrah and Cabernet Sauvignon. And this spring, the winery planted a new 10-acre property in west Osoyoos that includes three acres of Merlot. In 2005, when the first vines were being planted by Moon Curser, Chris planted Merlot because he thought that he could always buy it. Today, Merlot, along with many other varietals, is short supply, forcing vintners to grow their own. Chris’s viticultural choices have made for challenging grape growing but also for a very interesting wine portfolio. Take Arneis, which Chris grows, along with Dolcetto, because he has roots in northern Italy, where that white varietal produces crisp and fragrant table wines. “In Italian, Dolcetto means little sweet one, where Arneis apparently is little rascal,” Chris says. So far, he has produced three vintages of Arneis – and each one ripened at a different time. Take Tannat, best known for the robust reds made with the varietal in Uruguay and in the south of France. The unusual chemistry of the grape challenged Chris with stuck fermentations when he first made it, something since mastered. The next challenge was how to use the rustic red in a blend. After trying a number of varietals, he took the suggestion of his wife, Beata, to make a Syrah/Tannat blend. (Both owners trained as winemakers in New Zealand.) That now comprises the blend of Moon Curser’s flagship red, Dead of Night. Then there are Chris’s adventures with Touriga Nacional, the great Portuguese red varietal. An Osoyoos neighbour with Portuguese roots decided to plant some vines. With no viticultural experience, he canvassed the possibilities with Chris and settled on Touriga because it is a Portuguese varietal. Not quite all; enough survived that in 2011, about two barrels of wine were produced from what had once been a two-acre vineyard. When an effort to replant did not succeed, the neighbour sold the vineyard to Chris in 2012. Never one to back away from a challenge, Chris salvaged cuttings, had them propagated and planted them in a different vineyard. He made his first significant volume of Touriga Nacional in 2016 – a wine so good that it won a platinum medal this fall at the Lieutenant Governor’s Wine Awards. Carménère is another varietal grown just by a handful of B.C. wineries. It was grown widely in Bordeaux pre-phylloxera but, because it is a late ripener, was not replanted often in France after phylloxera. The varietal did thrive in Chile, which has no phylloxera, and has been revived during the past 25 years. Black Hills Winery and Moon Curser were the first Okanagan wineries to plant it. Moon Curser is also among a handful growing Tempranillo, a Spanish varietal that is not quite as challenging as the other non-mainstream varietals. “All it cares about is heat,” Chris has found. “If you get a cool fall, it gets to a certain ripeness and just sits there.” In a cool vintage like 2011, Tempranillo wines were light. Most subsequent vintages have produced bigger, richer Tempranillo. Moon Curser does pretty well with varieties that are grown more widely in the Okanagan, such as Syrah, Cabernet Sauvignon, Petit Verdot and Malbec. Here are notes on Moon Curser’s current releases. Moon Curser Arneis 2017 ($22.99 for 344 cases). The wine begins with aromas of papaya, honeydew melon and citrus leading to a medley of flavours echoing the nose. Bright acidity gives the wine a crisp, refreshing finish. 91. Moon Curser Afraid of the Dark 2017 ($20.99 for 797 cases). This is a blend of 45% Viognier, 40% Roussanne and 15% Marsanne. The wine begins with aromas of stone fruit. On the palate, the wine delivers robust flavours of apricot and nectarine. 91. Moon Curser Dolcetto 2017 ($24.99 for 387 cases). This unwooded red begins with aromas of plums, cherries and cloves. These are echoed on the palate, along with notes of blackberry. The texture is round and juicy. A little chilling is called for to enhance the wine’s exuberant freshness. 90. Moon Curser Carménère 2016 ($39.99 for 407 cases). This wine begins dramatically with aromas of cherry, black pepper and a medley of cooking spices. On the palate, the wine is rich with flavours of cherry, mulberry and spice. 93. Moon Curser Tempranillo 2016 ($30.99 for 287 cases). The wine begins with aromas of blueberry, cherry and plum leading to flavours of cherry, plum and leather. The finish is generous and savoury. 92. Moon Curser Touriga Nacional 2016 ($39.99 for 303 cases). A bit of a tour de force, this complex red begins with aromas of violets, fennel and cherry, with more dark fruit on the palate along with fig and chocolate. Long, silky tannins give the wine a generous texture. 94. Moon Curser Syrah 2016 ($25.99 for 924 cases). The wine welcomes with aromas of plum, black cherry, vanilla and black pepper. The aromas are echoed on the palate, along with flavours of fig, plum, licorice and pepper. The wine is full-bodied. 93. Moon Curser Malbec 2016 ($30.99 for 388 cases). The wine begins with intense and floral aromas of blueberry and mulberry leading to flavours of blueberry, plum, black cherry and a hint of oak. Long, ripe tannins give the wine a luscious, mouth-filling finish. 93. Moon Curser Border Vines 2016 ($25.99 for 1,412 cases). This is a blend of 44% Cabernet Sauvignon, 24% Cabernet Franc, 20% Malbec, 7% Petit Verdot and 5% Carménère. The wine begins with aromas of cherry, black currant and blackberry, followed by flavours of black currant, leather and spice on the firm finish. 92. Moon Curser Petit Verdot 2016 ($30.99 for 189 cases). In the glass, this wine presents with the classic, almost black hue of the varietal. It is a dense, concentrated wine with aromas and flavours of black cherry, spice and slate. This wine should be decanted or cellared a few more years; at this stage, it still has plenty of grip. 92. Moon Curser Cabernet Sauvignon 2015 ($39.99 for 289 cases). This wine begins with aromas of cassis and mint. On the palate, there are flavours of black cherry, black currant, vanilla and coffee. Long ripe tannins give the wine a generous texture. 92. Moon Curser Dead of Night 2016 ($39.99 for 380 cases). This is a blend of 50% each of Syrah and Tannat. Full-bodied and deep in color, the wine begins with aromas of plum and black cherry. On the palate, there are flavours of black cherry, fig, leather and licorice. This is a bold wine drinking well now but with the structure to cellar for 10 more years. 95. Moon Curser Tannat 2014 ($39.99 for 121 cases). This wine is available only to wine club members and in the tasting room. Concentrated and bold, it has aromas of plum, chocolate and coffee leading to a medley of dark fruits on the palate. 92. To cap its first full year in downtown Penticton, Time Winery plans to be open for New Year’s Eve this year. It is what you can do when you are an urban winery. Time is operated by industry icon Harry McWatters and his family. Originally, the winery was going to be on Black Sage Road. Harry was about a year into construction when that property was acquired for Phantom Creek Estate Winery, which expected to open next year. Never at a loss for a back-up plan, Harry in 2015 purchased a four-screen movie theatre which had recently closed in Penticton. After an extensive renovation, the building reopened this year. It now features a full-service restaurant encompassing a long wine-tasting bar, the locale for the New Year’s party. 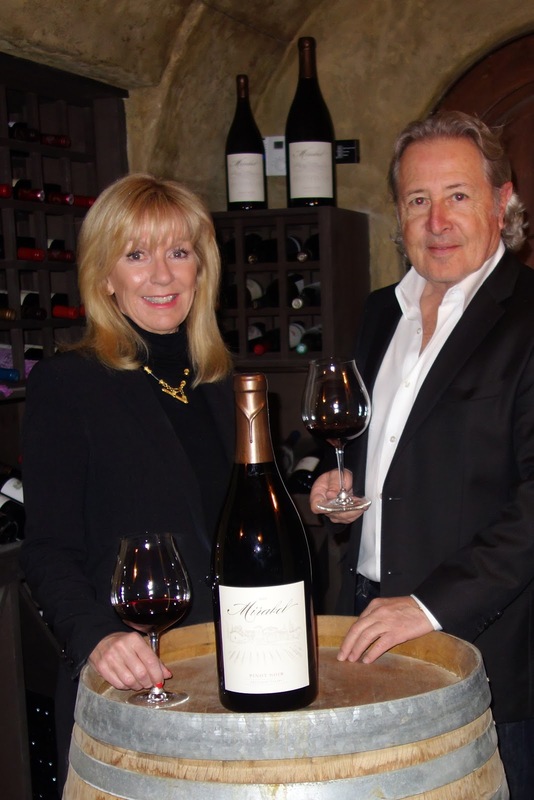 Harry, the founder and former owner of Sumac Ridge Estate Winery, has a history with what was formerly the Pen-Mar Theatre. Harry also has a history with urban wineries in Penticton. His first winery job (in sales) was in 1968 with Casabello Wines, then a major producer with a winery on the city’s Main Street. After Casabello was folded into the Jackson-Triggs Winery, its Main Street property was redeveloped with retail stores. By that time, Harry had moved on to found Sumac Ridge in 1980 with partner Lloyd Schmidt. Sumac Ridge was acquired in 2000 by Vincor International. Harry stayed on for another eight years until stepping down to pursue consulting opportunities. Eventually, he launched wines under the McWatters label and then, because he still owned a Black Sage Road vineyard, he launched Time. In 2018, Harry has been celebrating his 50th vintage in the Okanagan wine industry. I asked him what some of the memorable vintages have been. The 2017 vintage is also memorable. The quality of the fruit was excellent and Harry planned to do the entire first crush in the Time winery that fall. That plan was frustrated by development and construction delays. As usual, Harry found a backup. However, the 2018 vintage was done in the new winery. By coincidence, the fermentation room formerly was the theatre to which Harry took his date those many years ago. Harry has a top-flight winemaking team working with. 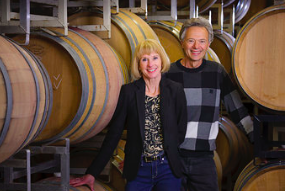 In June, Graham Pierce (left), the former winemaker at Black Hills Estate Winery, took over as director of winemaking at time. His right hand is Nadine Allander, formerly a winemaker at Poplar Grove Estate Winery. The 12,000-square-foot former theatre has a capacity to produce about 25,000 cases a year, with bottled wines stored offsite. If Harry is around, chances are that he will take guests on a tour. Time Riesling 2017 ($22.99). The wine begins with aromas of citrus lightly mingled with petrol. On the palate, there are flavours of lime and lemon. The palate is refreshing and the finish is crisp. 92. Time Sauvignon Blanc 2017 ($22.99). This is a barrel-fermented wine. The oak is very well integrated, supporting aromas of lime, peach and pear. 90. Time Meritage White 2017 ($25). This wine begins with aromas of honeydew melon, pear and citrus. These are echoed in the flavours, which are framed subtly with oak (a portion of the wine was barrel-fermented). 92. Time Viognier 2017 ($22.99). The wine has the classic aromas and flavours of stone fruits and apples. The flavours are fresh and vibrant with lively acidity. 91. Time Rosé 2017 ($22.99). This wine begins with aromas of cherry and grapefruit. On the palate, there are flavours of cherry and strawberry. It has a lingering and dry finish. 90. Time Cabernet Franc 2016 ($24.99). This wine has aromas and flavours of black cherry, blackberry, black currant and chocolate. The brambly flavours linger on the rich palate. 92. Time Merlot 2015 ($24.99). This plump, full-bodied Merlot reflects the ripe 2015 vintage. It appeals with aromas and flavours of black cherry and cassis. 91. Time Meritage Red 2016 ($29.99). This blend of Bordeaux varietals begins with aromas of red berries including currants and cherry, along with a note of spice. All of this is echoed on the palate of this elegant and polished wine. 92. McWatters Collection Meritage 2016 ($29.99). This Meritage is bold, with aromas and flavours of cassis and black cherry, along with a note of vanilla. The long, ripe tannins give this wine a mouth-filling texture. 92. Time Chronos 2013 ($85). This is a bold, concentrated red blend with seven varietals. Only 100 cases have been released. It has aromas and flavours of black cherry, plum and dark chocolate. 95. Ben Bryant, an Australian winemaker with an exceptional resumé, has joined Mission Hill Family Estates as chief winemaker. There has been no formal announcement even though he arrived in the Okanagan in August. It seems with everything else on its plate, the winery decided to sit on the announcement until the Vancouver International Wine Festival in February. Ben succeeds another Australian, Darryl Brooker, now Mission Hill’s general manager, who in turn succeeded John Simes who retired in 2014 after running Mission Hill’s cellar since 1992. “I found Ben through contacts in Australia,” Darryl says. “It took me a year to convince him to come.” He succeeded after flying Ben and his wife to the Okanagan. Here, Ben was swept away by the Okanagan’s beauty, the winemaking opportunities and the passion of Mission Hill’s owner, Anthony von Mandl. Darryl draws a parallel between Ben and John Simes, who is now retired. When Mission Hill recruited John in 1992, he was already the senior winemaker with New Zealand’s largest winery. Ben, who is about to turn 40, has risen rapidly through the winemaking ranks in Australia and had become the chief winemaker in Australia for Pernod Ricard Group. Then he enrolled in the wine science program at Charles Sturt University, where he graduated in 2005. He had joined Orlando Wines (a predecessor to Pernod Ricard) where he became the chief winemaker at Wyndham Estate in 2010, moving on to a senior marketing role in 2013. That same year, Pernod Ricard sent him to Hong Kong for an 18-month stint as a brand development manager. He returned to Australia in the fall of 2014 as chief winemaker for the Pernod Ricard group, including Jacob’s Creek. It is clear from that background that Mission Hill has landed a chief winemaker with both extensive technical experience as well as business experience. The wines at Township 7 Vineyards & Winery have gone from strength to strength since 2014, when Beijing businessman Ge Song bought the winery in 2014. 0 cases; to buy a major Oliver vineyard; and to update the equipment in the winery. He pulled all of this together by hiring winemaker Mary McDermott, a talented winemaker from Ontario. Township 7 had been making good wines before that but Mary has raised the bar significantly. Here are notes on this fall’s releases. Township 7 Muscat 2017 Rock Pocket Vineyard ($17.97 for 78 cases; wine club only). This wine begins with delicate ginger and rose petal notes. The dry palate delivers flavours of orange peel. The crisp finish is lingering. 91. Township 7 Sauvignon Blanc 2017 ($18.97 for 548 cases). Fermented in stainless steel, the wine begins with lime and stone fruits, leading to flavours of lime, guava and quince. The finish is crisp with lingering herbal notes. 90. Township 7 Chardonnay 2017 ($20.97 for 648 cases). Half of this wine was fermented in new 1,000-litre oak fermenter. The other half was fermented in stainless steel. The wine begins with aromas of apple with subtle accents of vanilla. The flavours echo the aromas. There is also a rich buttery note on the finish. The commendable restraint on the oak means the wine delivers fresh fruit flavours. 91. Township 7 Reserve Pinot Gris 2017 Estate Vineyard ($26.97 for 148 cases). This wine was fermented in neutral oak and in barrel a further five months. It begins with appealing fruity aromas – peach, ripe apricot – that lead to flavours of pear and melon, with a hint of spice on the finish. The texture is generous and the finish is long. 91. Township 7 Cabernet Sauvignon 2016 ($27.97 for 788 cases). The grapes for this are from the Blue Terrace Vineyard at Oliver which has supplied Township 7 since 2000. This was the vineyard which the winery purchased this summer. The wine, which was fermented in 5,000 litre oak fermenters, begins with aromas of black cherry and black currant mingled with toasty oak. On the palate, the flavours echo the aroma, with bright berry notes on the finish. The tannins are long and ripe. 90.